John Boorman is a mediocre director, whose great films (there are at least four), are driven by great performances. Left to his own devices with a limp cast, things go horribly wrong. Not even the decorous Charlotte Rampling can save this one, nor Sean Connery riding around Wicklow in a red nappy. Not even the hinge in the creaky plot which follows from the discovery Connery makes in a library. Connery plays Zed, who rapes, pillages, and murders his way across a post-apocalyptic world in the service of the "Immortals" and their God Zardoz, a flying stone head. Zed kills the pilot of the head (later revealed as Zardoz himself), infiltrates the "Vortex," where the Immortals live a dull utopian life, and finally destroys them. The film is long and pretentious, if a visually stimulating, examination of the philosophy of life, though its conclusions are either banal or nonsensical. Zardoz plays with both Freudian and Hegelian concepts of power. Under hypnosis, Zed reveals that he is the product of a eugenic project devised by Zardoz himself. 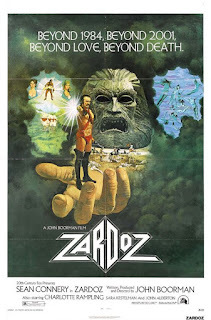 Zardoz, merely one of the Immortals in fancy dress, had taught Zed to read by means of selective pillaging and magic tricks involving books. He makes the (deliberate?) mistake of exposing Zed to the Wonderful WiZARD of OZ. Zed, smarter than he looks, joins the dots, and the destruction of the Vortex his lonlong-drawn-outvenge against the smokescreens and puppetry. A ruined library provides the catalyst for destroying the last outpost of civilization, a mumbled metaphor for this zany, psychedelic adult fairy-story.